It’s so hot I’m sweating through the knees of my pants. Instead of hitting the bars, we step into Square Books. Opposite the grand white Lafayette County Courthouse, Square Books was given the Publishers Weekly Bookstore of the Year Award in 2013 and is widely considered one of the best booksellers in the world. Oxford is a town of extremes. Its football fanaticism finds competition only in its enthusiasm for literature. It is a clash of paradoxes: liberal and traditional, black and white, rich and poor, sophisticated and flashy, a place of good-ole-boys and snobs alike. These juxtapositions may be reasons the state of Mississippi has produced so many noteworthy writers. What has been called home by football stars has been the same to writers such as William Faulkner, John Grisham, Larry Brown, Willie Morris, Barry Hannah, Tom Franklin, Richard Ford, Chris Offutt, and Ace Atkins. If the Vaught-Hemingway Stadium is the football headquarters of Mississippi, Square Books is certainly that for literature. Founded in 1979 by current owners Richard and Lisa Howorth, Square Books has become a major destination for writers of the South and beyond, hosting about 150 author events every year. Just inside the door, new hardbacks signed by authors who’ve read here recently have been stacked on tables. On the staircase leading upstairs, book collectors will find signed first editions from major authors such as John Grisham and Jim Harrison. A section on Mississippi and its authors and one on Faulkner are features that distinguish Square Books from other booksellers, as are the autographed photos of authors who have read at or visited Square Books over the years which seem to fill every possible blank space on the walls. 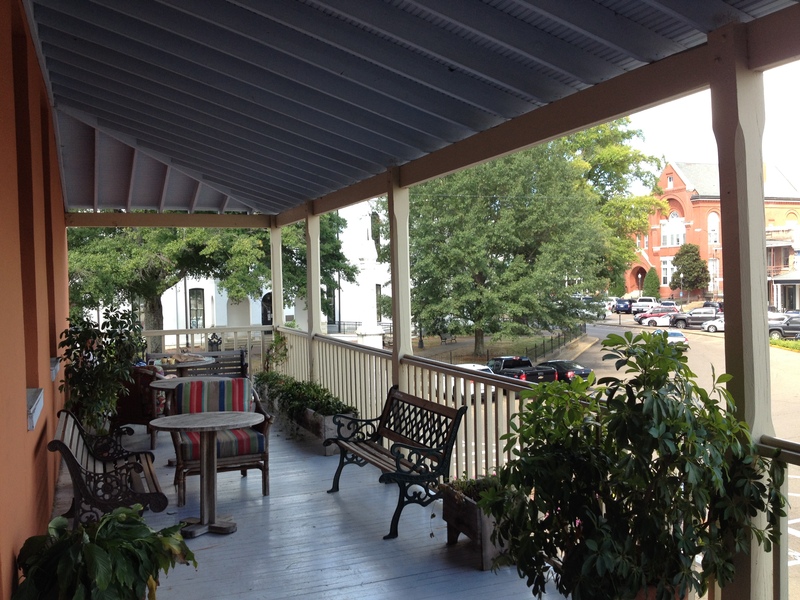 The upstairs has a small cafe, and the balcony offers the best view of the courthouse from the south. Finally, we link up with friends for dinner. The best bang for your buck, and what I’d argue is the best restaurant on the Square, is Ajax. An old-fashioned Southern diner, food at Ajax ranges from $7-13. Notable dishes like country fried steak, chicken and dumplings, pulled pork barbecue, fried catfish, and hot tamale pie guarantee to set you straight. This is a place where cornbread dressing, macaroni and cheese, and sweet potato casserole with marshmallows are called vegetables. Portions are very generous and everything on the menu is worth a postcard home. With throwbacks of red and white checkered tablecloths and oldies playing on the radio, the atmosphere is just right for a good time while making you feel at home. Sometimes there’s live music on the weekends. Among our dinner companions is Max Hipp, a guitarist for Greater Pyrenees, who will be playing later tonight. Max leaves early to do a sound check, and soon we follow him to Shelter on the east side of the Square. This underground coffeeshop is literally underneath Neilson’s department store, the oldest in the South and the 16th oldest in the country. Shelter doesn’t have wifi, so it tends to be filled less with folks plugged into headphones and doing work than it is a gathering place for people in the community. With comfortable couches arranged around coffee tables, it offers a cozy atmosphere accented by local art and is a great place to spend an evening or duck out of the heat or cold. 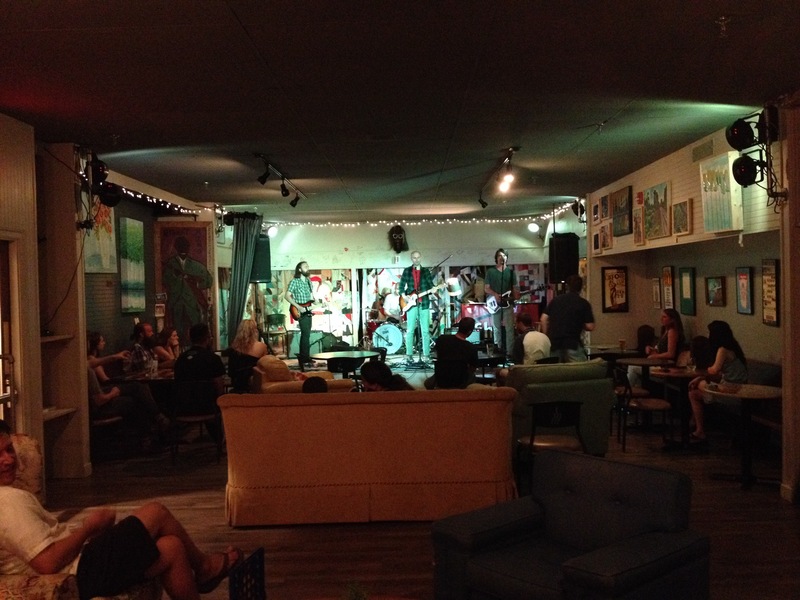 There are often readings and live music, depending on the night. The beer is local, the coffee good. Tonight, I get an espresso and my favorite Yalobusha beer, Larry Brown Ale, named after the famous Oxford firefighter and writer who wrote Facing the Music and Big Bad Love. Greater Pyrenees recently signed with Fat Possum Records, a local label that represents musical giants such as Al Green, RL Burnside, Waylon Jennings, Band of Horses, Youth Lagoon, Modest Mouse, Spiritualized, Junior Kimbrough, Water Liars (named after the short story by Barry Hannah), Tennis, the Black Keys, and the list goes on and represents a wide spread of musical tastes. Greater Pyrenees sound like an indie Coldplay. They put on a quality show perfect for this cafe, music you could dance to in a place where it’s not expected. A couple good beers and a couple hours of music with friends is a nice change from the full day out and about in football-crazy Oxford. It’s a welcome alternative to the wear and tear of a home game victory night in the bars. Sunday, the silence is different from that of yesterday morning. Car doors shut, a light breeze moves through tall oak and magnolia leaves, and hungover travelers by the carfull depart Oxford early. Now, a calm laziness hangs over the day. It happens to be William Faulkner’s 119th birthday, and we’ll be going to his antebellum home, Rowan Oak, to attend the special broadcasting of local radio show Thacker Mountain, usually held on Thursdays at 6:00 PM at Off Square Books (the used Square Books bookstore, where author events such as readings and book signings take place). But before we go honor Mississippi’s literary godfather, duty calls. It’s time for some barbecue. Barbecue is a serious matter. Before committing to a barbecue joint, there are a few ways to determine if it will be worth your palatal and emotional investment. A barbecue restaurant should have such a low profile it is invisible to the untrained eye. If what you see is fancy, keep looking. The focus should not be on glamor but on the food itself. If you find a place with potential, look at the people there. Are they locals? Are they construction workers, businessmen, preachers, doctors, students and lawyers? Good barbecue brings communities together; if the clientele is too homogenous, you’re probably in the wrong place. And, finally, the last test before tasting should be the smell. If you smell smoke, chances are you’re in a good spot. B’s Bar-B-Q meets these criteria. An extension of a gas station, B’s is easy to miss, but any local knows this is the place to get your comeback fix. You’ll smell the hickory smoke. Do a little looking around, and you’ll find a pile of hickory wood out back. Not many places actually smoke their barbecue anymore, but here at B’s meat is smoked slowly at low temperatures, some cuts for up to 10 hours overnight. Their pulled pork is smoky and tender, the brisket as soft as taffy, and the dry-rub ribs—well, just get as many as you can. Open seven days a week, there’s no excuse to miss B’s Bar-B-Q unless you’re a vegetarian, and, in that case, it might be worth reconsidering your priorities, even if only for one meal. Having fixed ourselves with all things meat, we walk the 10 minutes from the Square to Rowan Oak licking our lips. 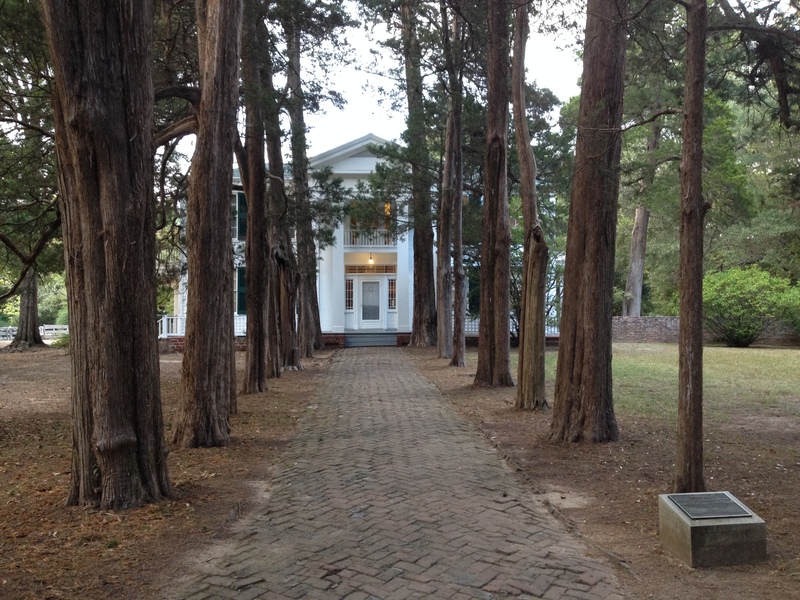 A main gravel path between two rows of tall cedars lead to the columned front of this antebellum house, trees planted when the house was built in 1848 with the belief they would prevent the Yellow Fever which devastated Oxford and Memphis. The house stands behind these slanted trees, stately but not extravagant, its simple white elegance and broad square columns of the porch inviting and understated. Faulkner bought the house in 1930 without telling his wife, Estelle. He didn’t have the money to pay for it, so he churned out the only book he claims to have written solely for money: Sanctuary. To Estelle’s amazement and perhaps his own, his ploy worked. Nevertheless, Rowan Oak was an odd house to have purchased at the time. No one had lived in it for seven years, and it lacked basic modern amenities such as plumbing and electricity. It was also undesirable by most because its antebellum construction was a reminder of the days before the South was devastated by the Civil War and Reconstruction; it was a reminder of a past lost forever. William Faulkner lived at Rowan Oak until his death in 1962, winning the Nobel Prize for Literature in 1949-50. In 1973, the house became a museum; the University of Mississippi owns and maintains the property. The grounds are free and open to the public between dawn and dusk, and touring the house, preserved with original furniture and books and a room where Faulkner outlined a novel on the walls, is only $5. Curator Bill Griffith knows just about everything regarding Faulkner. Tours led by Bill may be booked ahead of time for groups of 10 or more. Otherwise, tours are self guided, although staff will be present to answer questions about anything Faulkner-related. If you can only make one stop in Oxford, go to Rowan Oak. Tonight, for William Faulkner’s birthday, we congregate in the field to the west of the house lined with cedar fences from which lights have been strung and converge above us like stars. A stage has been set in front of Faulkner’s stables. A lover of riding horses, it is ironic that falling off his horse precipitated his death. Today, we celebrate this author whose courageous prose challenged the values of a segregated South, simultaneously admitting the sense of loss all Southerners feel for times passed. We remember him on his own property, where he wrote almost all his books. The evening, quiet, humid, on the verge of autumn, has an ethereal feel. With a keg of free beer and a birthday cake for Faulkner, a modest crowd forms, people lying out on blankets or sitting in folding chairs. Hosted by Jim Dees, Thacker Mountain provides music by house band the Yalobushwhackers and former Galactic member Maggie Koerner, as well as inviting curator Bill Griffith to the stage to talk a little about Faulkner as a person, his quirks and wry sense of humor. When the show’s over, we all retreat into the night, the trees darkening our path, blocking the stars. We walk into the dream of this town of Oxford, Mississippi, hearing our steps and the steps of others as from a different life, as if they don’t belong to us. For a look at some of Oxford’s finest and most extravagant homes, drive or walk Lamar Boulevard about a half mile north and south of the Square. Visit William Faulkner’s grave in the Oxford Cemetery. Bring a small (or big) bottle of bourbon, and have a drink with him. You may see other bottles left out for him. Jack Daniels was his choice for sipping whiskey, but when he was hard up for cash (most of the time), he’d drink Four Roses bourbon. For fine dining, consider City Grocery and St. Leo (on the Square) or Snackbar just up North Lamar. Handy Andy’s on North Lamar has the best burger in town. Their barbecue is decent, but frankly doesn’t compare with B’s. See Part I for ideas of places to stay and nightlife options. If interested in live music, try the Lyric theater (http://www.thelyricoxford.com/) and Proud Larry’s (http://www.proudlarrys.com/) or pick up a free copy of the Local Voice (outside just about any store on the Square or here: http://www.thelocalvoice.net/). 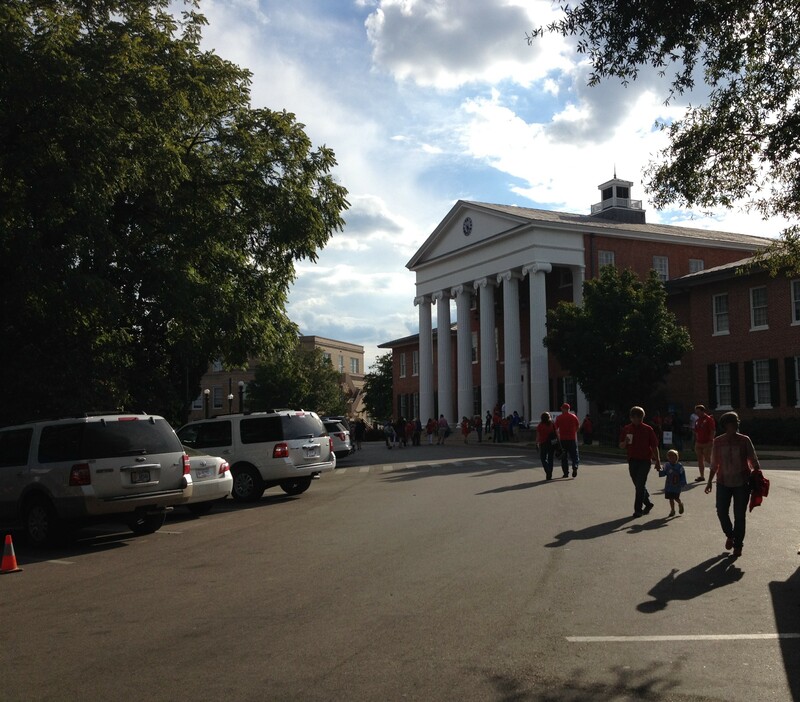 The University of Mississippi (Ole Miss) has a very beautiful campus within walking distance of the Square and Rowan Oak. A triangular route starting and ending at the Square would be a great way to spend a morning or afternoon. A quarter mile trail will take you from Rowan Oak to the University Museum on campus. Keep walking west on University Avenue until you see the Grove, a field shaded by massive oaks and magnolias, and beyond it the Lyceum, the university’s oldest building. Built in 1848 (the same year as Rowan Oak), the Lyceum served as a hospital during the Civil War. Its columns still bear marks from bullets shot during the early 1960s, when integration of the university led to race riots. Holly Springs (30 minutes north). Beautiful antebellum homes. Its town square is similar to Oxford’s but shows by comparison how the University has buoyed Oxford economically. Water Valley (25 minutes south). Yalobusha Brewery ($10 for six different beer samples and a tour). Clarksdale (1 hour and 15 minutes west). Location of the legendary crossroads where Robert Johnson sold his soul to the Devil in order to play the guitar. Former home of Tennessee Williams. Tupelo (1 hour East). Birthplace of Elvis Presley. Memphis, TN (1 hour and 15 minutes northwest). Feasible to travel through Holly Springs on the way to Memphis. Memphis is worth several days, at least.